All Koalakrane machines stand out from competitors with their sturdy construction, dependable components, and eye-catching designs. Koalakrane machines utilize tempered safety glass to ensure durability and safety. Our crane machines have user-friendly operator interfaces. Our claw machines are available in different sizes that can vend from very small to large plush toy sizes. Whether it be a small takeaway store or a large shopping mall we have the right machine. 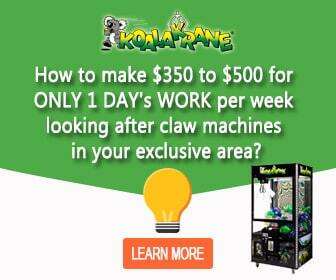 Koalakrane machines make fun, enjoyable additions to arcade centres, amusement parks, family restaurants, and more! Contact us now! Great technical support – even after hours and weekends! For any queries about the machine, please email us through this form.